Trump, on a trip to California, said the killing “should never have happened.” The report on Tuesday will explain who the U.S. government believes killed Khashoggi and what the overall impact of his murder is, Trump said. It was unclear who is producing the report. Trump made the remarks hours after the State Department said the government was still working on determining responsibility for the death of Khashoggi, a U.S.-based Washington Post columnist. Trump discussed the CIA assessment by phone with the agency’s director, Gina Haspel, and Secretary of State Mike Pompeo while flying to California on Saturday, White House spokeswoman Sarah Huckabee Sanders told reporters. The CIA had briefed other parts of the U.S. government, including Congress, on its assessment, sources told Reuters on Friday, a development that complicates Trump’s efforts to preserve ties with the key U.S. ally. Khashoggi was killed in October at the Saudi consulate in Istanbul when he went there to pick up documents he needed for his planned marriage. As lawmakers push legislation to punish Saudi Arabia for the killing, both Republican and Democratic senators on Saturday urged Trump to be tough on the crown prince, with whom he has cultivated a deep personal relationship. Trump and top administration officials have said Saudi Arabia should be held to account for any involvement in Khashoggi’s death and have imposed sanctions on 17 Saudis for their role in the killing. 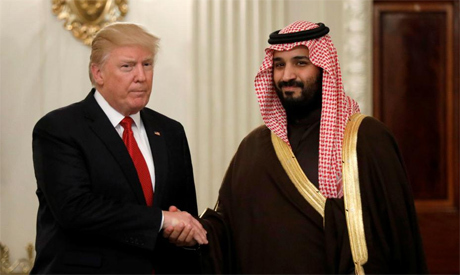 But they have also stressed the importance of Washington’s ties with Riyadh, one of the biggest clients of the U.S. defense industry. Trump wants to preserve the Saudi arms deals, despite growing opposition in Congress. Marine General Joseph Dunford, chairman of the Joint Chiefs of Staff, noted on Saturday that the kingdom plays a key military role for the United States in the Middle East. On Thursday, Saudi Arabia’s public prosecutor said he was seeking the death penalty for five suspects charged in the killing of Khashoggi. The prosecutor, Shaalan al-Shaalan, told reporters the crown prince knew nothing of the operation, in which Khashoggi’s body was dismembered and removed from the consulate. Saudi officials have said a team of 15 Saudi nationals were sent to confront Khashoggi and he was accidentally killed in a chokehold by men who were trying to force him to return to the kingdom.